Brick Township Police, from left to right: Chief James Riccio, Sgt. Paul Catalina, K9 Echo, Ptl. Scott Smith, Ptl. John Turrin, K9 Vader, and Captain Steve Gerling. Brick police have a new officer on the roster, and his name is Echo. After training with other officers and police dogs from Monmouth and Ocean counties since September, Ptl. Scott Smith and Echo, his new partner, are ready to hit the streets. Echo is a German Shepherd and the latest dog to join the department. During the recent training, Vader, a Labrador retriever who received his initial training last year, was certified in human scent tracking. Vader is handled by partner Ptl. John Turrin. Echo will serve as a patrol dog while Vader has previously served as an explosives detection dog. The graduation ceremony was held at the Toms River Police Department where family, friends and command staff of several departments gathered to celebrate the completion of the graduates’ training. “These dogs are capable of tracking and patrol work, and could potentially go on to specialize in various areas of policing and public safety,” said Brick Police Sgt. Jim Kelly, the department public information officer. The police K9s live with their handlers, who often have families and other pets of their own, and quickly become a part of those families, Kelly said. Every day when the handler goes to work, the K9 is eager to join him or her, expressing as much loyalty and protection as any police partner could ever offer, he added. The dogs also become a part of the larger law enforcement family, wearing bulletproof/stab-proof vests, appearing with their handlers at community policing events, and putting on demonstrations. “These animals bravely face the same dangers of their human counterparts every single day,” said Kelly. Some of the training completed by Echo and Ptl. Smith over the 16-week course included, but was certainly not limited to, agility, handler protection, officer protection, verbal command control, socialization, tracking scent, and building clearing. 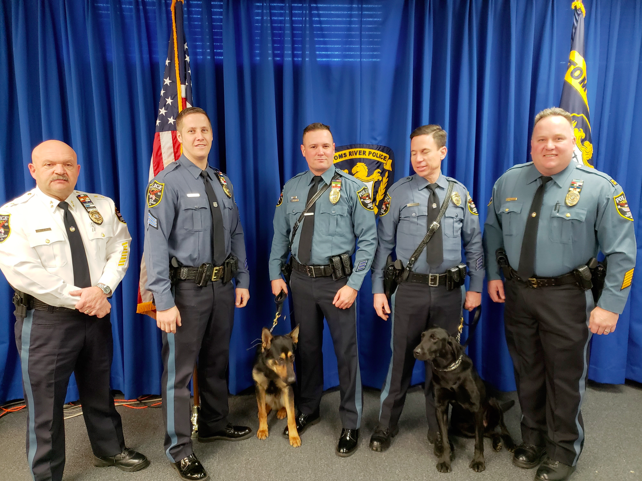 Brick Township now has five K9 teams: Sgt. Paul Catalina and Duke; Ptl. Keith Prendeville and Max; Ptl. Daniel Fogerty and Rigby; plus Echo and Vader and their handlers. Catalina served as an assistant trainer in the course, which was led by Sgt. James Reilly, a Toms River K9 handler.